The inaugural NY2LA Sports Lone Star Invitational continued play on Saturday. With hundreds of college coaches and some of the nation’s top prospects and travel programs in Dallas for day two, the NY2LA Association put on another good show for those in attendance. The 17U Division saw 2017 SF Teddy Allen of the OSA Crusaders impress in the morning while 2019 SF Marcus Domask and Ray Allen continued to deliver quality efforts at the 15U level. Akenten continues to rise this spring. A sweet shooter with a 6-foot-6 frame, Akenten can pretty much get any jumper he wants. He might settle too much, but when the ball is going through the net for Akenten, it goes in at a high rate. Akenten finished with a team-high 17 points in Saturday’s loss. Able to shake his man and pull-up off the bounce, Akenten is a terrific rise and fire shooter that makes difficult shots look easy. He was a bright spot despite a lopsided loss for the Celtics/Hoopers Saturday morning. Who wouldn’t want a player like Alausa on their team? Alausa is a player that knows his role and does it to the best of his ability every time out. A 6-foot-7 forward, Alausa swats everything on the interior and believes every rebound on both ends of the floor is his for the taking. Alausa is long and somewhat raw, but it’s obvious he puts in work in the weight room and uses his strength to his advantage. He’ll go toe-to-toe with anyone on the floor and does a great job of outworking people for post position, allowing him to turn and score easily. Allen got off to a great start in Saturday’s blowout win over the Illinois Celtics/Hoopers. Allen set the tone early with his imposing physical play and three-point shooting, scoring his team’s first 13 points of the game. Allen was a mismatch problem all game long, sizing up his opponent and either going to the basket or taking a shot from deep. Allen was a flat out assassin. With the defense draped all over his every move, Allen just elevated his level of play. Allen scored 14 of his game-high 18 points in the first half and by that point the game was well out of hand. Allen was 7-for-13 from the field, including 2-for-4 from three-point range. Cunningham is a terrific blend of power and finesse. A 6-foot-7, 240-pound power forward, Cunningham is a difficult player to defend 1-on-1 in the post. He’s too strong and wide for defenders to get around and holds his position down low very well. Once he catches, Cunningham showed the ability to finish with an array of moves. Cunningham notched a double-double in Saturday night’s loss to Reach Legends, recording a team-high 14 points (7-11) and 12 rebounds. Surprise, surprise…Domask found his way into the top performers section. All the state champion freshman does is pack the stat sheet and win games. Ray Allen Select went 2-0 on Saturday, including a nice win over the Illinois Irish in their final outing. Domask kept it simple again and lived at the free throw line en route to a game-high 20 points. The 6-foot-4 swing man makes the defense foul him by establishing low, early post position. If he’s not headed to the line, Domask has an array of primary and secondary post finishes to get the job done. Domask just makes defenders uncomfortable because he’s so skilled off the ball and works to pin and seal his man. He didn’t shoot the ball from three-point range as well as he normally does, but make no mistake, Domask can knock down triples at a high rate. Epps was pretty much perfect in Saturday’s win over New Mexico Force and if you by his shooting percentage, he was. Epps was a perfect 7-of-7 shooting from the field for a team-high 14 points. A smooth, athletic wing, Epps made it look easy at times, putting the ball on the deck and slashing to the basket. Epps also owned the glass with a team-high nine rebounds. The 6-foot-5 junior also showed the ability to dish the basketball with three assists. Garrett just has some special qualities about his game. Sometimes it doesn’t matter how many defenders have surrounded him or how well he’s being defended, Garrett can just make a play. A terrific all-around point guard, Garrett had some spectacular finishes at the rim against multiple defenders. A player that doesn’t settle, Garrett will attack and attack without forcing until he needs to take a perimeter jumper, where he’ll hit from a high rate as well. A tremendous feel for the game, Garrett runs the show offensively and can spark the attack his with passing ability as well. Garrett doesn’t mind putting the team on his back and understands he needs to do more than just score in order to win a game. He finished with 13 points and a handful of assists in Saturday’s loss to All-In Young & Reckless. Johnson did a little bit of everything in Saturday’s blowout win over the Oklahoma Magic in the 17U showcase. The unsigned senior help the Swing shake off a rough start with a couple key early baskets. Johnson brought energy with his passing the open floor, drawing defenders and dropping the ball off for easy scores. Johnson also got after it defensively, getting his hands on the basketball and creating fast break opportunities. A strong shooter, the 6-foot-6 swing man can also hit tough, contested jumpers from the perimeter. The talented big is quickly becoming a huge story this spring as he continues to deliver quality efforts and he continues to add offers to his plate. Strom has solid instincts and feel and he can deliver around the basket and step away with positive results. He is consistently dominant game in and game out and he was much of the same in a morning victory over Indy EBC where he delivered a 16 point 7 rebound performance while going 6 for 6 from the field and knocking down a couple trey balls. One of the fastest rising prospects in the association, Arians continued to boost his stock on Saturday. 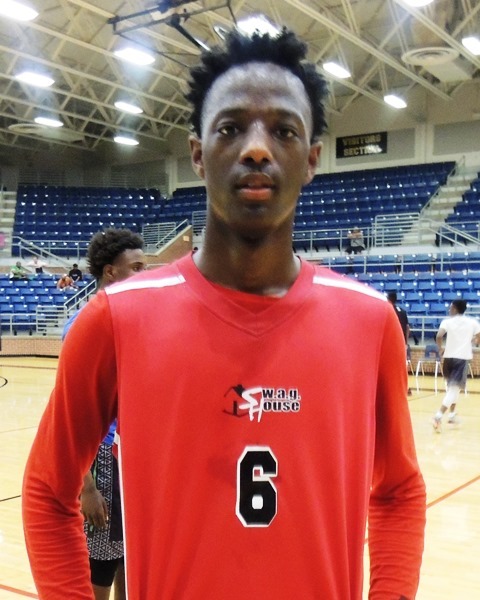 The 6-foot-4 wing scored 13 of his game-high 15 points in the first half during a blowout victory over the Oklahoma Magic in the 17U showcase. Arians is a smooth wing that’s crafty and slippery in traffic and able to work his way around the defense. Best known for his shooting ability, Arians can knock down triples at a high rate, especially when left open. Bates has a big time upside. The 6-foot-5 freshman is a strong, athletic presence in the middle of the floor. Defensively, he’s a great shot blocker, both on the ball, and from the weak-side. Offensively, he’ll run the floor in transition and displayed a good balance of power and finesse in the paint. Despite Saturday’s loss to the Illinois Stars, a low-scoring affair, Bates had a game-high 13 points. A competitive, tough guard, Brock is always operating at 100 percent. Brock has a strong 6-foot-0 frame and uses that well to his advantage. Using a quick first step, Brock puts his head down and makes the defense foul him or get out of his way as he attacks the basket. With the defense sagging off him to give themselves an extra step, Brock pulled up from three-point range and knocked down a couple triples. He finished with a team-high 18 points in Saturday’s loss to Ray Allen Select. Cellentani scored a game-high 15 points against the Wisconsin Swing on Saturday. The 6-foot-4 freshman was very aggressive and made it a point of emphasis to draw contact. Cellentani made his living at the free throw line, muscling his way inside and getting the defense in the air. 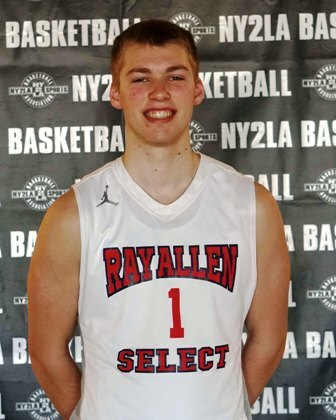 A player who looks like he’ll be able to expand his game further away from the hoop as time goes on, Cellentani is a prospect we’re eager for more looks at this spring. Croell might be quiet on the floor at times, but his impact is felt big time in a game. A solid all-around guard, there’s really not anything Croell doesn’t do well. The lefty has some length, listed at 6-foot-4, and uses that to his advantage once he works his way into the paint. Corell has a soft touch and a nice floater he uses near the basket. A terrific passer, Croell makes the right play with the basketball. He didn’t score a lot of points in Saturday’s loss to Iowa Elite, but dished out a lot of assists and racked up quite a few rebounds. Garwood is an intriguing skilled forward with a lot of promise. Unfortunately, he injured his ankle in Iowa Elite’s final game on Saturday, but we saw everything that was needed. Garwood can stretch the floor with his shooting and even back down opponents and fade away from the post. Able to handle the ball on the perimeter, Garwood can even play a bit of a point forward role with his ability to bring the ball up in transition and pass from the top of the key or high post area. He was in double figures on Saturday morning and was well on his way to another strong performance in the afternoon prior to the injury. Jenkins had a huge second half to help push the game into double overtime during Saturday’s loss to Yanders Law. Finishing with a game-high 21 points, Jenkins scored 15 of those in the second half alone. A good looking, 6-foot-1 combo guard, Jenkins is a smooth dribble penetrator. Jenkins attacked well of the bounce and displayed the ability to hang in the air and finish around defenders. McCaskill took over the second half for Yanders Law in their 15U victory over the Wisconsin Swing. McCaskill seized control, attacking at every opportunity and converting some difficult, acrobatic attempts inside. A 5-foot-11 freshman, McCaskill has length and athleticism to be the slasher that he is. He finished with a game-high 24 points in Saturday’s win over the Swing, 16 of which came after halftime. McCaskill also had a good effort in the evening during a win over the Wisconsin Shooters, going for a team-high 18 points. O’Mara came up with a couple key baskets in the second half to help the Illinois Stars hold off The Force. The 6-foot-5 freshman impressed with his versatility and ability to play and guard a number of different positions on the floor. O’Mara gives the vibe that he’s going to develop into a mismatch problem. A forward that can handle and shoot the ball and also do some things in the post, O’Mara has skills to be a wing, stretch forward, or perhaps a center if he grows like his older brother (Xavier center Sean O’Mara). Schwannaecke is a good looking shooting guard to watch in the coming years. Balanced across the board, there’s not many flaws in his game early on. A 6-foot-2 freshman, Schwannaecke can catch and shoot from the perimeter. When he puts the ball on the deck and gets to the hole, Schwannaecke showed the ability to hang in the air and finish with either hand. He was in double figures during Saturday’s loss to Ray Allen Select. A talented guard with nice size, Trabue was impressive in a morning loss to a tough Omaha Elite squad. The young guard can knock down the perimeter jumper with range that extends beyond the arc. He also has solid instincts on both ends giving him the ability to contribute across the board and make an impact by being disruptive on the defensive end of the floor. Nana Akenten has offers from Buffalo, Toledo, Chicago State, Illinois-Chicago, Illinois State, Green Bay, and Northern Illinois. He listed interest from Iowa, Wisconsin, Nebraska, and Rice. Teddy Allen is receiving interest from Nebraska, Creighton, North Dakota State, and Nebraska-Omaha. Jameel Alausa has offers from Princeton, Yale, Illinois-Chicago, and North Dakota. He listed interest from Cornell, Dartmouth, Penn, Northwestern, Stanford, and Drake. Logan Strom has added an offer from San Diego.